Les descriptions de scènes de lecture dans trois romans de Jules Verne – Paris au XXe siècle (1863), Voyages et aventures du capitaine Hatteras (1866), et Vingt Mille Lieues sous les mers (1869–70) illustrent une pratique générale d’écriture que je nomme la lecture itinérante. Le lecteur voyageur démontre sa maîtrise d’un imaginaire textuel par la lecture en dehors – ou mieux, autour – des unités que sont la page et le livre, et par la recombinaison des éléments d’un ensemble textuel en de nouvelles séquences. Cette structure oriente aussi bien le rôle de la lecture dans les fictions de Verne que ses propres rapports avec ses précurseurs littéraires. The subject of this essay is a way of reading – to be precise, a way of representing the scene of reading – in the fiction of Jules Verne, which I will call errant reading or reading around. My examples of Verne’s errant readers are drawn from three early novels – Captain Nemo (Twenty Thousand Leagues under the Seas [Vingt Mille Lieues sous les mers], 1869–70), Dr. Clawbonny (The Adventures of Captain Hatteras [Voyages et aventures du Capitaine Hatteras], 1866), and Michel Dufrénoy (Paris in the 20th Century [Paris au XXème siècle], 1863?) – and I will discuss each in the reverse order of his literary creation. Verne is, I propose, working out a model and perhaps a theory of reading in general, the procedural double of his methods of literary composition, in the decade between his creations of Dufrénoy and Nemo; this is more clearly seen if we work backwards, from 1870 to 1863, rather than in the order in which the novels were written. 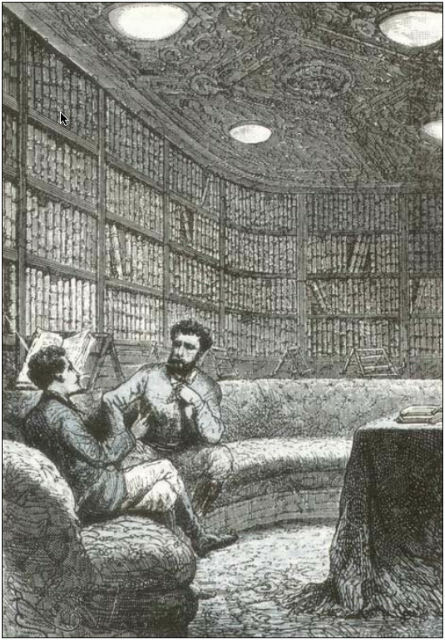 The method of errant reading is equally as significant in later novels of the Voyages extraordinaires – in relation to an expanding Vernian corpus, it may be more significant in those novels – but the evidence for the method is more subtle in those works, since it has become by then a typical trait of Verne’s textual operations. Figure 1. Captain Nemo’s library. Illustration by Alphonse de Neuville (1869–70). Verne shows us how to read around in the description of the most famous of his imagined libraries. We may easily miss the cue. Captain Nemo is leading Professor Aronnax on his first tour of the Nautilus (20M I, xi–xiii). Passing from the captain’s dining room to the adjacent library, Aronnax is astonished by the size and scope of Nemo’s book collection: its 12,000 volumes, he observes with undisguised envy, would honor any terrestrial palaces (Figure 1). Among them, he writes, are “the masterpieces of the ancients and moderns, all of the most beautiful that humanity has produced in history, poetry, the novel, and the natural sciences” [“les chefs-d’oeuvre des maîtres anciens et modernes, c’est-à-dire tout ce que l’humanité a produit de plus beau dans l’histoire, la poésie, le roman et la science”] (20M I, xi). The library is also notably disordered: “Curiously, all of these books were not classified according to any system with respect to the languages in which they were written” [“Détail curieux, tous ces livres étaient indistinctement classés, en quelque langue qu’ils fussent écrits”]. This disorder proves, Aronnax conjectures, “that the captain of the Nautilus could read any of the volumes upon which his hand should chance to fall” [“que le capitaine du Nautilus devait lire couramment les volumes que sa main prenait au hasard”] (20M I, xi). On its face, the jumble of Nemo’s shelves seems a minor element of the novel’s narrative mechanics: either the trait of a library well- and often-used (in which case its disorder does not advance the story in any important way); or a datum meant to sharpen the reader’s curiosity (in which case we presume that the messy shelves are a clue). Uncommon ease in such a library as this: only an expert of many disciplines and languages could have created the technological marvel that is the Nautilus. A vast and subtle collection without an ordering scheme: the intrigue of Nemo’s origins – the novel’s great enigma – is sustained; no signal will be found in the arrangement of his books regarding his mother tongue or the nation of his birth. Yet Aronnax remarks that he finds the library’s disorder unexpected, un détail curieux. In the previous chapter, Nemo claimed fluency in four of the six languages represented by authors Aronnax discovers in the library. Later events indicate that the captain of the Nautilus speaks at least a fifth language, in addition to the mysterious lingua franca used by his crew. Evidence on his bookshelves of Nemo’s linguistic competence, then, should not be especially noteworthy. Aronnax’s surprise and his way of accounting for the jumble requires the conjecture of another scene, which he never witnesses and never describes to the reader. He must imagine – we must imagine – Nemoreaching to a volume at random and reading from it, with an attitude combining pure spontaneity and absolute ease – a sort of hazardous care: artful but unmannered, the sign of an assured familiarity with every outcome that might be presented to the hand and eye by such a method. For its implicit textual sociality, such a gesture is imagined to take place in physical isolation. Nemo, we soon learn, reads alone in the still of night or during those times when he seems to be absent from the Nautilus. He leaves opened and annotated books scattered about the library, from which Aronnax decodes the breadth and variety of his host’s literary habits. The minor datum of the jumble thus crosses over into a pure convention of the reading scene: the image of a master-reader in solitary meditation amid the farrago of his texts – Nemo as a submarine Jerome (as the saint is often depicted) encircled by careening piles of books and papers, his eyes on the page but his mind directed elsewhere. In that scene, categorical disarray is, ironically, the surest sign of an implied textual system: for such a reader, the chaos of his shelves and lectern mark merely an indifference to any one book taken alone, or with regard to a prescribed scheme of classification; each is valued according to its role in multiple, transbibliographic regimes, which obtain in the moment in which it is read. Bibliographic disorder also proves this reader’s redoubtable literary competence: that he can assign any book – whichever his hand may fall upon – to its proper place in a textual imaginary demonstrates that he reads outside of – around – elementary units of the page and the book. They are disordered on his shelves; the master-reader grasps them in terms of other orders and in his own terms. Such a reader also defines with his hand and eye his position in the textual imaginary. 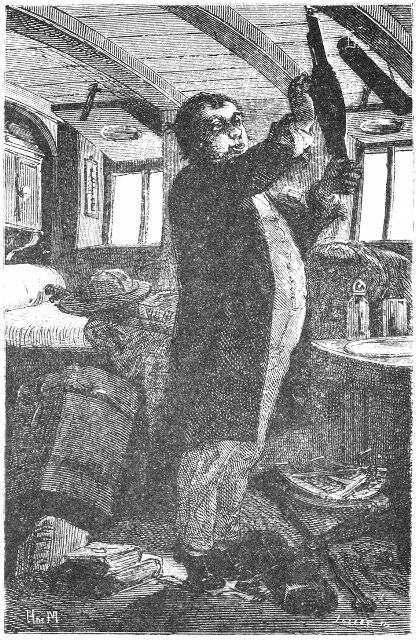 As the Forward prepares to leave Liverpool for a destination as yet unknown, Dr. Clawbonny (The Adventures of Captain Hatteras [Voyages et aventures du Capitaine Hatteras]) packs his tiny cabin on the ship with his instruments and books (Figure 2). The happiest animal,” he observes, “would be a snail that can grow a shell to its liking” [“un colimaçon qui pourrait se faire une coquille à son gré.”] “And, upon my word,” the narrator adds, his cabin was soon turned into a shell that he would not need to leave for a long time. The doctor gave into the delight of the specialist or the child while putting his scientific baggage into order. His books, his herbaria, his precision instruments, his physics apparata, his collection of thermometers, barometers, hygrometers, and rain gauges, lenses, compasses, sextants, maps, diagrams, vials, powders, the flasks of his complete traveling pharmacy – all of it was arranged with an order that would have shamed the British Museum. This space of six square feet contained incalculable riches; the doctor had only to reach out his hand to instantly become a physician, a mathematician, an astronomer, a geographer, a botanist, or a conchologist. Figure 2. Clawbonny in his shell. Les Aventures du capitaine Hatteras I, iv. Illustration by Edouard Riou (1866). [Et ma foi, pour une coquille qu’il ne devait pas quitter de longtemps, sa cabine prenait comme tournure ; le docteur se donnait un plaisir de savant ou d’enfant à mettre en ordre son bagage scientifique. Ses livres, ses herbiers, ses casiers, ses instruments de précision, ses appareils de physique, sa collection de thermomètres, de baromètres, d’hygromètres, d’udomètres, de lunettes, de compas, de sextants, de cartes, de plans, les fioles, les poudres, les flacon de sa pharmacie de voyage très complète, tout cela se classait avec un ordre qui eût fait honte au British Museum. Cet espace de six pieds carrés contenait d’incalculables richesses; le docteur n’avait qu’à étendre la main, sans se déranger, pour devenir instantanément un médecin, un mathématicien, un astronome, un géographe, un botaniste ou un conchyliologue.] (CH I, iv). How does Clawbonny know in advance that he will need all these things? He doesn’t know; moreover, it will turn out that he won’t use most of them and all of them will be lost with the destruction of the Forward at the end of Book I (CH II, i). The value of knowing or not knowing turns out, moreover, to be a more complicated matter. Stocking a reader’s cabinet with scientific instruments in addition to books doesn’t alter the fact that methods of research are determined by the shape and order of the cabinet. It’s the thoroughness of the narrator’s catalogue that matters above all in this scene of contented categorization, in that it establishes conditions of use that should recall to us the characteristic operations of Nemo’s library. The resources that Clawbonny arranges in the confines of his cabin similarly cross a wide range of disciplines without settling for long on any one; Clawbonny is able to grasp them all with the same assured gesture; whatever his other talents may be, the doctor is a man who knows how to use a library effectively. As improbable as it may seem, the value of that particular talent on a polar expedition will be proven repeatedly in later chapters, when Clawbonny moves the adventure forward or saves the lives of himself and his companions by summoning from memory a crucial datum he has read. He does this with uncanny accuracy; the reader will often feel – justifiably – that Clawbonny is reading to her verbatim from a text ready at hand. The formidable memory of the book-man [homme-livre] (Lidenbrock, Clawbonny, Paganel, Palmyrin Rosette, Cyrus Smith, etc.) is among Verne’s signature contrivances. Notably, in the case of Clawbonny, the connection of the contrivance to specific conditions of reading is spelled out for us. Early in the novel when he is asked by Richard Shandon if he knows where the Forward is bound, Clawbonny protests that he doesn’t know, but that this doesn’t bother him much. People say that I’m learned; that’s a mistake, commander: I don’t know anything. If I’ve managed to sell a few books, I was still wrong; the public is very kind to buy them! I don’t know anything, I repeat, except that I know nothing. Now someone has offered to complete or, rather, to reconstitute my knowledge of medicine, surgery, history, geography, botany, mineralogy, conchology, geodesy, chemistry, physics, mechanics, and hydrography; well, I accept and I assure you that there’s no need to beg! The doctor, in fact, knows a great deal about polar geography, history, hydrography, and the rest, but he knows only what he has read about these things – that is, he knows only what Verne has read about them. (And, as William Butcher has shown, Verne gets many facts wrong because his sources are often in error.) We might therefore conclude that Clawbonny has joined the expedition because he seeks more practical foundations for his book-learning, but this would mistake the essentially unpragmatic foundation of his interests. It’s not what he says, in any case, and if we trace his character over the course of the novel, it would be difficult to say that he has become a more practical man at the end of the adventure. That kind of transformation would not be typical of Verne, whose book-men are never changed in that way. [Verne’s] aim is to summarize all geographical, physical, and astronomical knowledge gathered by modern science, and to reconstitute in the alluring and picturesque manner that is his trademark, the history of the universe. Practical applications of these disciplines is not at stake; worldmaking – the refashioning (refont) of a universe according to narrative and textual programs – is. Clawbonny’s complaint that, despite having sold a few books (the public is very kind to buy them! ), he is still inexperienced (ignorant) speaks also to Verne’s position as a novelist in 1865, when only three of the Voyages had been completed and the future success of the series was by no means assured. As an authorial practice, worldmaking requires a system of one’s own. Clawbonny’s arranging his cabinet according to an order that would shame the British Museum – in other words, superficially in the opposite state of the disorder of Nemo’s shelves – should not distract us from the fact that the order, however saturated, is Clawbonny’s alone; its logic is subjective and playful, akin, says the narrator, to a child’s fiddling with arrangements of her toys. Which is to say, it is an activity not in search of a single best order but of prolonging the pleasures of reordering and recombining – very different and, fundamentally textual, pursuits. The contents of Clawbonny’s snail shell represent in this regard less a model of scientific interdisciplinarity than its frankly literary variant – or even, of literariness tout court. This is how one becomes a Vernian book-man of the first rank: by reaching out with confidence into a textual field, taking from it whatever is needed and, more generally, situating oneself somewhere in the field in whichever role it requires, and then recombining it all into new sequences. 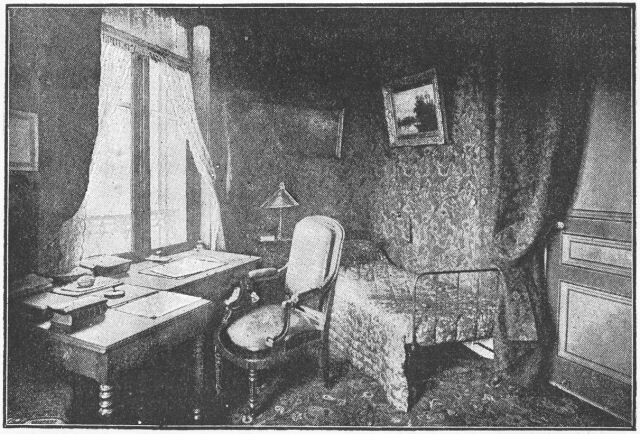 That the final item in the list of professions that the cabin offers the good doctor is that of a shell-specialist (conchyliologue) must be one of Verne’s winking nods to the reader regarding the structure of the scene: if you know how to read appropriately in this field you can become a specialist of its contours. But you have to learn how to read in this way. In the longest of three chapters of Paris in the 20th Century [Paris au XXème siècle, 1863?] detailing the decline of artistic culture in the modern city, Michel Dufrénoy spends a day with his uncle Huguenin in the latter’s modest apartment. After lunch, their conversation turns to Huguenin’s vast book collection, which covers nearly every surface of the apartment. Every wall is lined with shelves, and volumes spill over into the bedroom, are stacked on the furniture and over the doors, and fill an unused fireplace. The piles of books on the windowsills are so high, the narrator reports, that sunlight can enter the apartment through a sliver of exposed glass only on the day of the summer solstice (P20 x). In this cramped space – it seems to fuse the enclosure of Clawbonny’s cabinet with the abundance of Nemo’s library – Huguenin leads his nephew on a tour of literary giants, most from the 19th century, whose works have been forgotten and whose contributions have been eclipsed by the 20th century’s fetishizing of machinery and manufacture. At the end of this parade of specters – Huguenin refers to them as an Army of Letters – Michel slips into a reverie as he surveys his uncle’s collection. Top: Verne’s writing-cabinet from 1882 until 1900, 2 rue Charles Dubois, Amiens. Photographs by C. Herbert (1895). Source: Belloc 1895, 209–10. He took up several of these beloved books, opened them, read a sentence from one, a page from another; from this one only the names of the chapters, from that one only the titles; he drew in that literary fragrance that rose to his brain like a warm emanation of centuries past; he grasped the hand of all of these friends of the past that he would have known and loved, had he but had the good sense to have been born sooner! We are already within a space and moving along a trajectory that Nemo, Aronnax, and Clawbonny will inhabit with greater confidence. Michel’s feelings of belatedness satisfy a crucial formal and narrative requirement of the novel: Verne needs a hero who grasps the depredations of an anti-literary modernity, but who also enters the scene too late and is haunted by nostalgia for a lapsed literary world. Michel’s naïve enthusiasm for the paratextual apparatus of his uncle’s library (the names of chapters, the titles of books, etc.) is that of the novice reader who has no experience of the institutions of literary culture, a behavior we might observe in any child first learning to read. His childlike relation to books is confirmed by another scene of apprenticeship in the novel, when he works as a reader of financial data recorded by Quinsonnas in the Grand Ledger of Casmodage et Cie. The Ledger, essentially a gargantuan book, is three meters high and outfitted with a system of moving ladders that allows its user to travel up, down, and across its pages, who is not only dwarfed but infantilized by its operations. Literary culture no longer exists in the twentieth century, we are reminded again and again in the novel; it has withdrawn to the cramped living quarters of an old man who may be the last master reader of the modern age, and who is reluctant to pass his obsessions on to his nephew (P20 iv). The only evidence that culture may still operate in a larger sphere is, ominously, the names engraved on the crumbling sepulchres of authors and artists in the Cimetière Père-Lachaise that Michel feverishly reviews in the novel’s final chapter – demonstrating thus without understanding it that literariness can be sustained by units in series that are more accidental and opportunistic than progressive or conclusive. (The perversity of Michel’s failure at the Grand Entrepôt Dramatique, where plays are manufactured according to specified programs, and appropriated from prior texts [P20 xiv], is that he struggles to embrace formulae that will be crucial to Verne’s eventual success as an author.) The exemplarity of Nemo’s jumbled shelves becomes clear in retrospect: a disorderly library is one that has been subjected to extra-bibliographic – but not extra-textual – forces. And – like the other reading cabinets in Verne’s fiction – its effects are activated by movement, which stands always (though not only) for a way of subjectively connecting points of relay between its elements. Et in pulverem revertis; or if not to dust, all disperses into a “literary fragrance” of centuries past, a perceptual metaphor for the diffuse, decentered experience of reading a general textual field. Michel wanders longingly in that field; that is his pathetic function in the novel. But he is incapable of reading in a manner appropriate to the field. Hetzel was right: Michel is a silly, a puerile poet. But he’s a poorer, an inexperienced, reader. One of the challenges of the novel, for which Verne was not quite ready in 1863, is how to depict in sympathetic terms a reader who is incapable of comprehending his textual condition. His talents for nuance and irony are not yet up to the task. Verne shows us the textual and intertextual bases of Michel’s plight, but he isn’t sufficiently confident of his technique to wrestle it from the anxiety of influence that errant reading may induce in the writing subject. How else do we explain a work written in earnest by an aspiring young novelist that imagines no future for literary endeavor, if not in terms of the oppressiveness of the systems of influence to which the novelist knows he belongs? The writer most obviously missing from Huguenin’s review of the nineteenth century is Jules Verne, and that absence is as much due to the constraints of a fantasy of belatedness as to the author’s discretion. In the early 1860s, Verne, a famously omnivorous reader – such that our understanding of errant reading can only be shaped retrospectively by the reader that Verne will become – has yet to assert his place in the literary imaginary. He will require another three decades to openly claim mastery of the fantasy in The Sphinx of the Ices [Le Sphinx des glaces, 1897], when he dares to revise Edgar Allan Poe, whose shadow looms over these systems nearly from their inception. Reading ahead and then back again helps us to discern the actual locus of change in these examples. We can thus mark some relations of influence, repetition and revision of Verne’s scenes of errant reading, but we should resist the temptation to reduce them to a series, above all, to one that progresses from the overburdened shelves of Huguenin’s cramped apartment, via Clawbonny’s orderly if still packed shell, to the sleek rayons of Nemo’s mobile library, and beyond. Verne’s technique evolves and matures, he grows more confident of his apparatus and more subtle in how he applies it, but all the elements of the reading scene are there from the beginning; their recombinations in the later works demonstrate a basic pattern throughout Verne’s career as a reader and an author, which is not, or not consistently, developmental. Errant reading dictates – the fundamental program of the Voyages extraordinaires demonstrates – another conception of literary influence and continuity. Belloc, Marie A. 1895. “Jules Verne at Home.” The Strand Magazine IX (February): 206–13. Butcher, William. 2006. Jules Verne: The Definitive Biography. New York: Thunder’s Mouth Press. Dumas, Alexandre. 1998. Le Comte de Monte-Cristo. Eds. Catherine Eugène and Claude Aziza. Paris: Presses Pocket. Dumas, Olivier. 2006. “Paris au XXe siècle revisité.” Bulletin de la Société Jules Verne (NS) 159: 29–31. ———. 2007. “Paris au XXe siècle revu et corrigé: Les Années 1863–65 de Jules Verne.” Bulletin de la Société Jules Verne (NS) 164: 4–6. Evans, Arthur B. 1988. “The Extraordinary Libraries of Jules Verne.” L’Ésprit créateur38.1: 75–86. Harpold, Terry. 2005. “Verne, Baudelaire et Poe – La Jangada et ‘Le Scarabée d’or’.” Revue Jules Verne 19–20: 162–68. Martin, Charles-Noël. 1978. La Vie et l’œuvre de Jules Verne. Paris: Michel de l’Ormeraie. Plato. 1982. Euthyphro / Apology / Crito / Phaedo / Phaedrus. Trans. Harold North Fowler. Cambridge, MA: Harvard University Press. Swift, Jonathan. 1957–69 [1726; 1735]. Gulliver’s Travels. The Prose Works of Jonathan Swift, Vol. 11. Ed. Herbert Davis. Oxford: Blackwell. Verne, Jules. 1864. “Edgard Poë et ses œuvres.” Musée des familles (April): 193–208. ———. 1966–71. Les Œuvres de Jules Verne. 50 vols. Lausanne: Éditions Rencontre. ———. 1978. Voyages et aventures du Capitaine Hatteras. Paris: Hachette. ———. 1994. Paris au XXe siècle. Ed. Piero Gondolo della Riva. Paris: Hachette. ———. 1998. Twenty Thousand Leagues Under the Seas. Ed. and trans. William Butcher. London: Oxford University Press,. ———. 2005. The Adventures of Captain Hatteras. Ed. and trans. William Butcher. London: Oxford University Press.